In a land known for consumption of gin and discernment of excellent quality in that spirit, one might wonder if an upstart brand from the other side of the pond stands a chance? We’re speaking of the United Kingdom, where in addition to the many established gin brands, numerous small gin distilleries are making a mark as well. With this barrier to entry in mind, we’re chuffed to note an increasing interest in and appreciation of Euphrosine Gin #9 from those distant shores. The first glimmer of interest came in our first international press hit a few years back. But then the attention went to another level when a UK expatriate in Arkansas sent a bottle of Euphrosine to Matt Burton of The Gin Shelf, which resulted in our first UK review of Euphrosine. Tom and Becky have commenced a world tour of gin distilleries, and we were first on the itinerary! 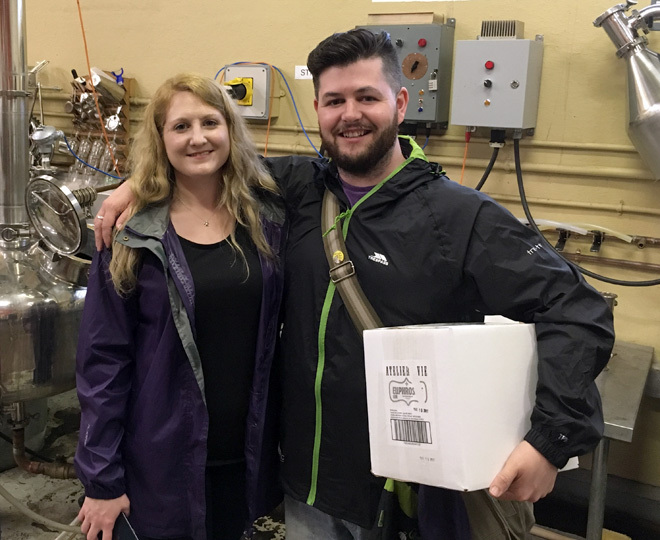 We enjoyed a lengthy visit and conversation with Tom and Becky on Euphrosine and other gin-related matters. We look forward to an upcoming article on the Gin Blog where Tom will provide his insights on Euphrosine. For now, check out their instagram photo set from their visit. Naturally, they didn’t leave empty handed. Their box includes both Euphrosine Gin #9 and a bottle of Euphrosine Gin #9 Barrel-Finished Reserve. This entry was posted in Atelier Vie, Barrel-Finished Reserve, Euphrosine Gin #9. Bookmark the permalink. Another UK fan here. The barman in the Q&C hotel in NOLA got me to try your gins and I wobbled back to the bar many times for a refill. He poured such big measures that I may have drunk about two bottles in my 4 night stay!